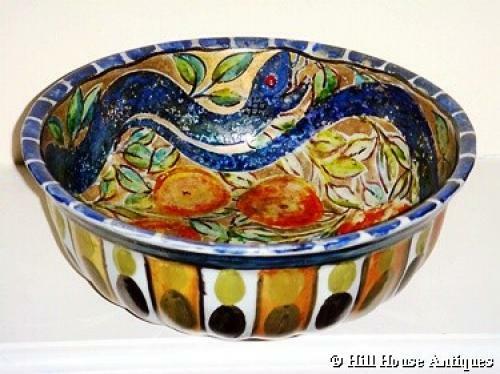 A good, lustre glazed, painted and decorated all over, pottery fruit bowl by John Pearson (1859-1930), of ribbed globular form with typical stylised fruit and plant forms as well as a snake all round the inner bowl. Signed to base. c1890. Approx 9.25" diameter and 3.5" high. For more info on John Pearson see the item descriptions of the other pieces we have by him.